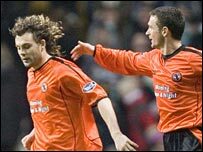 Former Celtic forward David Fernandez scored a late equaliser as Dundee United came from two goals behind to draw with the SPL leaders in Glasgow. The Spaniard had stabbed home United's first equaliser after John Hartson headed Celtic into an early lead. Maciej Zurawski headed Celtic's second and Stilian Petrov celebrated his new contract with a deflected third. But Lee Miller fired one back from close range before Fernandez broke clear to round keeper Artur Boruc. Celtic manager Gordon Strachan had attempted to solve his defensive problems by giving Mark Wilson his debut against his former club. Wilson replacing Paul Telfer at right-back, while Ross Wallace took the place of Mo Camara on the other side of defence. United were without player-manager Craig Brewster with a fractured leg but were first to come close to breaking the deadlock. Two desperate challenges by Adam Virgo, who had retained his place at the heart of defence, prevented Fernandez finishing from a good Grant Brebner cross. But Celtic opened the scoring when Barry Robson fouled Zurawski and Hartson rose unchallenged to head home Shunsuke Nakamura's flighted free-kick from five yards. Stan Varga glanced a header just wide from a Nakamura corner, but United fought back. Jim McIntyre twice tested Boruc from long range and Collin Samuel nodded wide from a Robson free-kick. Petrov did likewise at the other end, but it was United who scored next. A Robson free-kick was met by Alan Archibald, whose mis-directed header bounced into the path of Fernandez, who poked the ball home against his former club. Their good work was undone immediately after the break when Zurawski was found unmarked to head home a Shaun Maloney cross. Celtic had claims for a penalty waved aside after Stuart Duff barged into Maloney. Boruc prevented another equaliser when Ferhandez deceived Virgo and sent a drive towards goal that was well saved by the goalkeeper. But a Petrov drive was deflected past Derek Stillie by Derek McInnes as Celtic appeared to have made the points safe. Substitute Miller fired United back into the game, finishing from five yards from a McIntyre pass amid claims for offside before Fernandez completed the United fightback. Celtic: Boruc, Wilson, Virgo, Varga, Wallace, Nakamura (Pearson 72), Lennon, Petrov, Maloney, Zurawski, Hartson. Subs Not Used: Marshall, Keane, McManus, Camara, McGlinchey, Quinn. Goals: Hartson 9, Zurawski 49, Petrov 67. Dundee Utd: Stillie, McCracken, Archibald, McInnes (Miller 80), Robson, Kerr, Brebner, McIntyre, Duff, Fernandez (Goodwillie 90), Samuel. Subs Not Used: Gardiner, Samson, Kenneth, Robertson, Cameron. Goals: Fernandez 40, Miller 82, Fernandez 86.